Caption - Kenya was a great place to watch steam in action. Built to metre gauge East African Railways had a mostly British built fleet including garratts. One of my favourite classes is featured in this image. The class 24 4-8-0s were built by Vulcan Foundry in the 1920s and were still at work in December 1977 (and beyond). 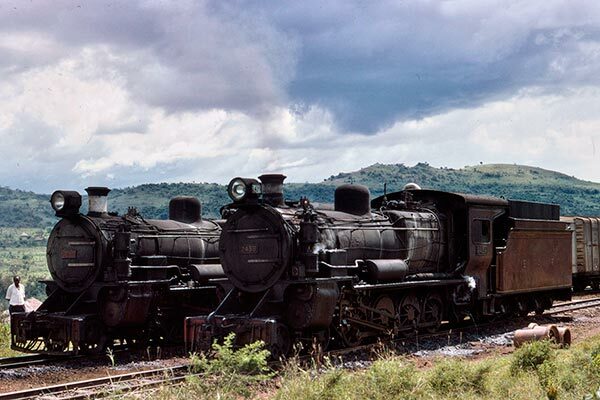 The locos are 2439 (nearest camera) and 2416 and are seen at Fort Ternan on the steeply graded line between Nakuru and Kisumu on Lake Victoria. Both were being used as pilot engines for more modern 2-8-2s on heavier trains.